(l-r) Dr. Hector Medina and Dr. David Burt outside the Claude Moore Health Sciences Library. 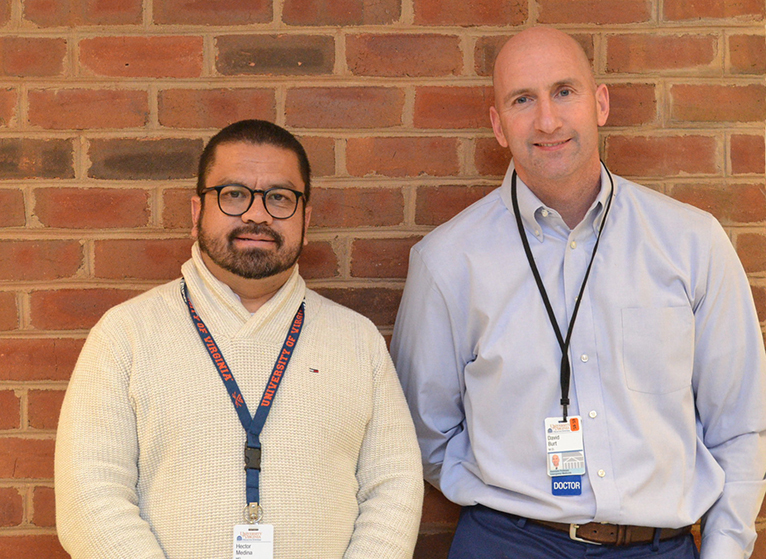 Last fall, UVA Connect sat down with David Burt, MD, Associate Professor of Emergency Medicine and Director of the UVA-Guatemala Initiative (UVA-GI), to discuss the UVA-Guatemala Initiative’s collaboration to design, build, and implement the Information Access Portal (IAP). The IAP is a digital hub by which Guatemalan healthcare providers and students can gain access to the latest in academic health information such as treatments, procedures, protocols, research, and therapies. This winter, we had the pleasure of chatting with Burt and colleague Hector Medina, MD, a physician at Totonicapán Hospital in Guatemala and Professor of Biology and Surgery at the Universidad de San Carlos de Guatemala, Quetzaltenango Campus, to discuss recent successes with ultrasound and an electronic medical record (EMR). UVA-GI’s mission is “to promote the development of mutually beneficial and sustainable relationships between UVA and the peoples and communities of Guatemala.” Partnership is the operating term here. These relationships build a network that persists from project to project. Over the past decade, UVA-GI has brought UVA students and faculty to Guatemala to work on projects that benefit the community in Guatemala. The collaboration UVA has with Totonicapán (Toto) Hospital has focused on how technology can make for better healthcare. Like the IAP, another example of technology’s impact is seen in UVA-GI’s effort in bringing point-of-care ultrasound to the Totonicapán Hospital Emergency Department. Last summer, UVA-GI did just that. It acquired an M-Turbo ultrasound machine and sent James Moak, MD, UVA Associate Professor of Emergency Medicine, to Guatemala to meet with Medina and other hospital staff to have a ceremony for a new ultrasound training collaboration. In October, Dr. Carlos González, one of the surgeons at Totonicapán Hospital, had a patient with a testicular hernia. Using the ultrasound, he was able to see that it wasn’t strangulated which made surgery urgent but not emergent. A patient was told she needed gallbladder surgery because she had large gallstones. Upon examination with the tool, it was discovered she had no gallstones and no inflammation over her gallbladder. Surgery averted. An elderly woman had fallen down a few days earlier and was suffering from abdomen pain — a fast exam with the ultrasound showed that she did not have any internal bleeding — but did have an abscess that physicians were able to drain. With every positive outcome, Burt, Medina, and the rest of the team are proving the partnership continues to have value for patients, for physicians, and for students. For now, the focus of the ultrasound’s use is in the emergency department however, because the hospital is small and the machine is portable, Medina and Burt look forward to using it in all departments as needs arise. “Without data, there can be no real progress in healthcare,” says Burt. With quality data, physicians are able to review and determine if good care is being provided and how it can be improved in the future. With electronic records, it is easier to review large amounts of data and make an analysis. Five years ago, Medina and visiting UVA medical students conducted interviews at various Guatemalan hospitals to determine why local care providers probably wouldn’t use an EMR, why it wouldn’t work, why they would dislike it, and why it might fail. “If we could understand these things, then maybe we could build something that would succeed,” says Burt. While those interviews were underway, another team of UVA students studied existing commercial EMRs and open-source products. The results were not promising: The commercial ones proved expensive and overbuilt; the free ones did not suit Toto’s needs. Burt, Medina, and the UVA-GI team had many barriers to overcome in getting this EMR launched. Totonicapán Hospitalis “in survival mode every day: employee strikes, not enough medicine, wrong-size chest tube for children’s surgery — there are so many assaults on a doctors’ ability to provide good care. It’s never-ending. Also, we needed to integrate nurses, but realize that — while the nurses are very good — they’ve never had formal exposure to computers. So, there’s additional training with basic computer skills needed. And there’s no money. And power supplies fluctuate and cause brown-outs, so the equipment has to have surge suppressors on them.” From top to bottom, it was a challenge. With Saber’s success in Toto’s emergency department, the team is hopeful that in the coming years it will be expanded to the rest of the hospital. Thank you to Dr. Burt, Dr. Medina, and the entire UVA-GI team for continuing such a wonderful partnership. We look forward to tracking your successes with ultrasound, EMR data, and the many other projects coordinated by the UVA-Guatemala Initiative! UVA-GI offers an array of opportunity for faculty, staff, residents, and students. If you’re interested, check out details on its website.